This particular piece is something I pinned ages ago, nearly one of the first crocheted things I pinned. I really liked the look of the star stitch and to be quite honest, I’ve always wanted to make a skirt and this seemed like a good project to try just in case I decided that I didn’t like how it looked as a skirt (since I’m not exactly a small girl and can be quite self conscious). You can find a rough pattern by Naiyaru here. I’m pretty sure that I won’t have enough yarn to make it as long as Naiyaru calls out the pattern since I’m having to make it a fair bit wider so that I can wear it as a skirt, but I think I have a few other colors I can add to the skirt if I want to give it a bit more punch and give it the length I’d be comfortable wearing it at. I also highly recommend watching the first few rows in the tutorial video on the page Naiyaru links to for the star stitch since the initial row for the star stitch in the video is for starting from the foundation chain. The yarn I’m using is Bernat Soy Natural Blends in Flax. 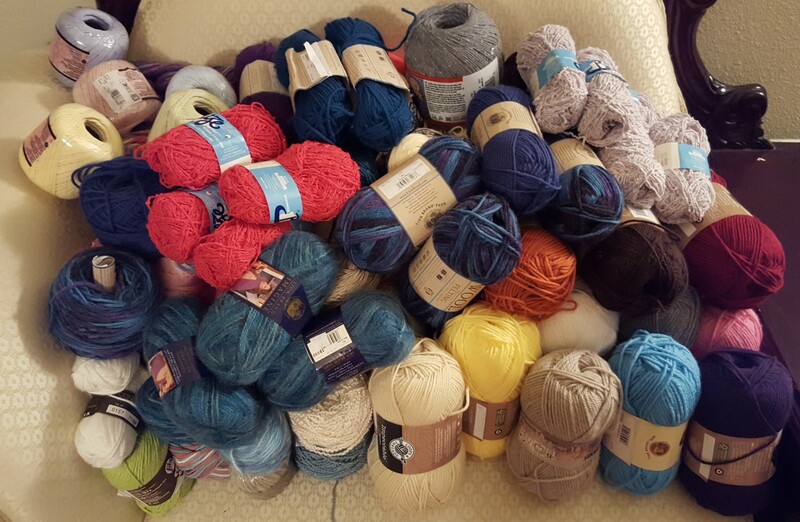 Which, as per most of my yarn hoard, is a discontinued style. It is a 50% soya and 50% acrylic combo. The yarn is very soft and has a bit of a shine too it. As it stands in the picture I’m a bit over halfway through my yarn and it definitely doesn’t seem like it’s going to be nearly long enough to cover my behind. I did try and initially crochet this in the round, but my foundation chain kept twisting, so I will have to sew up the side when I’m finished. It is coming out nice and thick since the yarn is held double. I’m thinking it’ll be a great winter accessory for here in Texas on the coldest days and a fantastic skirt. I loved your pictures of this on Facebook. I think it’s a fantastic skirt and looks really good on you!